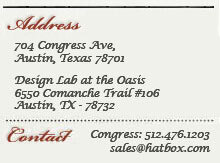 Invite Hatbox to Your Next Event! Having the Hatbox Hat Shaping Events Team at your events is a fun way of providing entertainment as well as a fabulous take home gift. There is a romance and thrill to hats that is totally unique. From corporate events for 500+ to a tea party for 25, our team makes every event memorable! From cowboy hats to fedoras, we have the perfect hat for your event theme and budget! Choose from Western, Classic, and Ladies' styles. Our Haberdashers begin by expertly sizing and fitting each of your guests. They then steam, shape and personalize each hat to make sure that each guest goes home with a one of a kind hat! Your guests get an experience they'll never forget, plus gifts they'll treasure forever. Whatever your theme, we can help you match the perfect hat. Want Fedoras and Cloches for a Roaring 20's bash? We got ya covered! Fascinators, Fedoras and Westerns are a nice touch at a rehearsal dinner for wedding party gifts. How about those Kentucky Derby parties... best selection in Texas! All of our packages include our team working with each of your guests to individually size, fit, shape and personalize their hats. We provide accoutrement (bands, pins, feathers, flowers, etc.) for your guests to choose from, to make each hat unique to individual tastes. 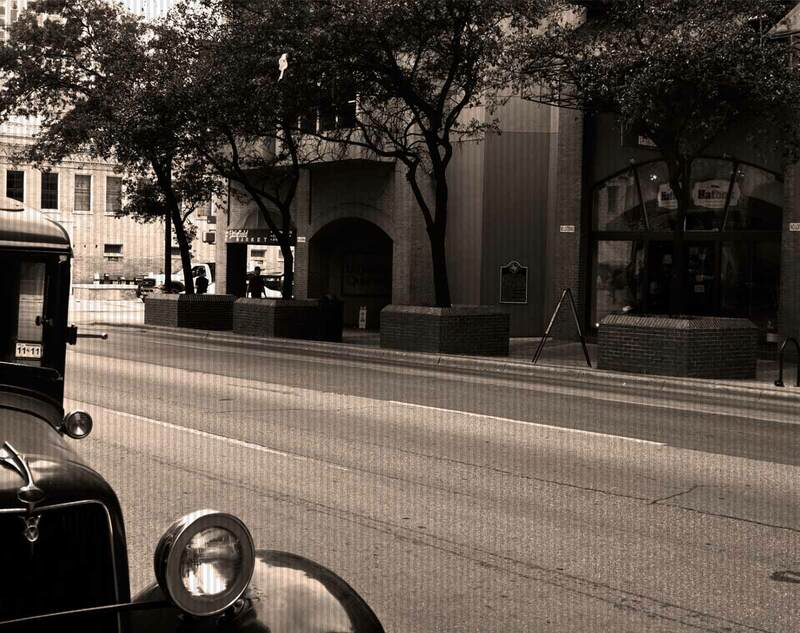 Our most popular packages are our "Austin", "Texas" & "Austin-Centric" packages. 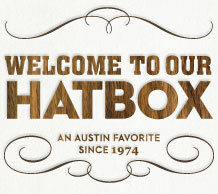 The Austin package offers a selection of hats with a focus on Austin trends and style... fedoras, flatcaps, floppies, pork pies... you choose! Our Texas package features the most requested Texas souvenir, the cowboy hat! 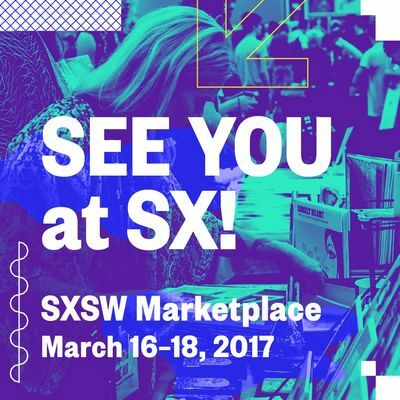 The Austin-Centric package combines the two... something for everybody! 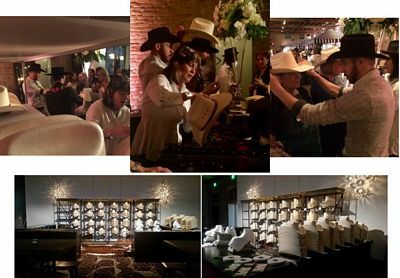 For the Texas package, our Hat Shaping Events Team will come to your venue with stacks and stacks of cowboy hats, a nice variety of hatbands, and steamers for shaping the hats. Our experienced staff will size & fit each guest, shape each hat (anything from classic to rockabilly) and then add the hatband and any other extras that your guest has chosen. It's a fun way of providing entertainment as well as a fabulous take home gift of an authentic Texas cowboy hat! Hat pricing is determined by quantity of hats needed, the accoutrement you choose, staffing requirements (determined by how many guests and how long we have to hat them) and your venue location (travel time)​. We have many hats in many price ranges, and if you share your budget we can put together a package of the styles available in your price range! Give us a call or shoot us an email for more details! Email [email protected] or call 512-476-1203 for more info. 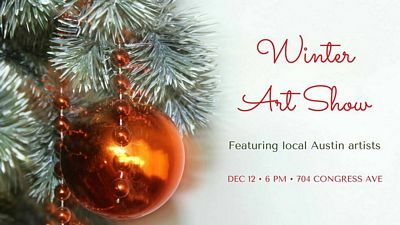 Please join us for the festivities on December 12, 2017 and do some Christmas shopping too! We have hats in everyone's price range! Can't decide? We also have gift certificates for purchase so they can decide on their own favorite hat! 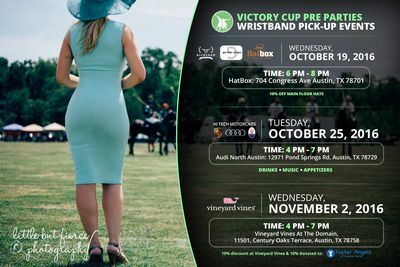 Join us at the Victory Cup Polo Match, Food and Wine Fest! Get your tickets now... prices increase Sept 1st! Come by Hatbox to find the perfect hat... and pearls! Get ready for the crisp fall air, a farm to table food and wine celebration at the Victory Cup’s Annual “Boots and Pearls”! Bring your entire family and even your dog and enjoy a gorgeous day of green grass, majestic horses, beautiful people and heart pounding polo! You will never forget this day! Take advantage of this deal and enjoy this kid friendly, pet friendly event while taking in classic cars, enjoying a picnic lunch, or just watching an awesome polo match with surprise celebrity players — on your own or with a group of friends!!! Both feature local, farm to table foods, beer and wine. The Victory Cup has broken the mold and throws a polo match that everyone can enjoy. This event is all about meeting great people, respecting the sport, the horses and the players and having a great time! Come, relax and enjoy the best day of your life – literally. We had a wonderful time at Design Lab for their first ever Rodea Dance Roundup! Yee Haw! Grab your boots and get ready to boot scoot the afternoon away! Join us as we celebrate our FIRST EVER Rodeo Dance Roundup . 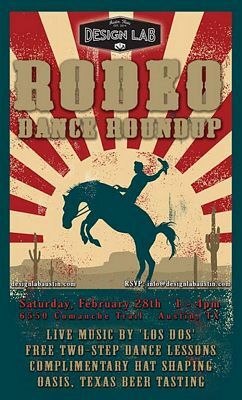 On Saturday, February 28, our Western Shaping Team will be at Design Lab from 1-4 pm for the First Ever Rodeo Dance Roundup! 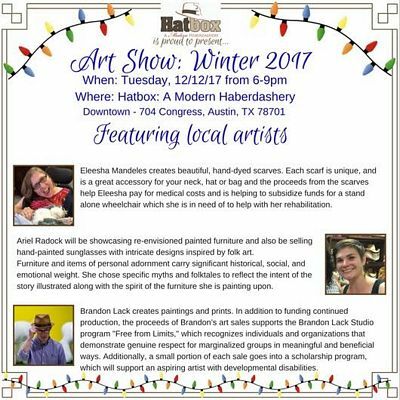 Enjoy live music from LOS DOS, free dance lessons, deals on some Texas made boots AND, you guessed it, Cowboy Hat Shaping!